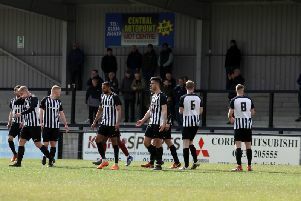 Tommy Wright is considering leading from the front when Corby Town face fellow strugglers Hednesford Town on Saturday. The Corby manager has named himself on the bench for the last two matches but played no part on the pitch in the 0-0 draw at Tamworth and last weekend’s poor 3-0 loss at AFC Telford United. With the Steelmen’s future in the Vanarama National League North now hanging by a thread, it could be a case of drastic measures for a drastic situation. As the Corby boss observed, he hasn’t started a match since the end of 2014. But he did play a key role as a substitute in the latter stages of last season’s glorious Southern League title success, not least setting up the goal that sealed it, which was scored by Spencer Weir-Daley in that unforgettable 3-2 victory at Poole Town almost a year ago. Saturday’s clash at Steel Park is a must-win for both clubs and Wright, who is staying on to lead the fight after considering his position after last weekend’s loss, insists that if he does play a part, he will show the fight that is required. “I probably haven’t got it in my legs to be honest, I haven’t started a game since September or October in 2014,” he said. “But I know that if I start the game I will give it everything I have got and if the other lads do the same then we will still have a chance. “It would be a sad state of affairs if I do have to come in and start a game for the first time in 18 months or so. “But I wear my heart on my sleeve. “This club is in my blood now. “I care about it, I care about my job and I care about my bosses because there are some great people behind the scenes. The Steelmen will be without Anton Brown who serves the second of a three-match ban while Massiah McDonald begins a two-match suspension. But they have added to their squad after signing Notts County defender Taylor McKenzie on loan for the rest of the season. The 21-year-old, who also had a spell with Gainsborough Trinity, will be available to make his debut on Saturday.